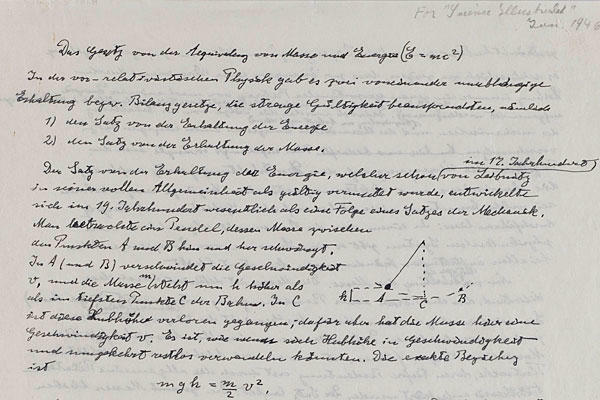 At speeds even he could barely imagine, Albert Einstein’s private papers and innermost thoughts will soon be available online, from a rare scribble of “E = mc2 ” in his own hand, to political pipe-dreams and secret love letters to his mistress. This image distributed by the Hebrew University of Jerusalem, shows a page from one of only three existing manuscripts containing Einstein's famous formula describes the relationship between energy, mass, and the speed of light. Check out this short clip of Albert Einstein in 1951, talking about his support for the Hebrew University of Jerusalem. Einstein became a founder of the Hebrew University after visiting Israel in 1919. ← Whose emic? Mine, Yours, Theirs? I loved Einstein’s laugh, at the beginning of the video. Peter, I did too! I’d heard this obviously incorrect rumor that the famous tongue photo of Einstein taken on his birthday was not characteristic of him. Now, hearing him laugh so freely, I rather doubt it.